When I was a kid, my dad’s childhood bedroom was still in my grandparent’s house. There was a big glass case in there that held several model cars that my dad built back in the early 1960s. 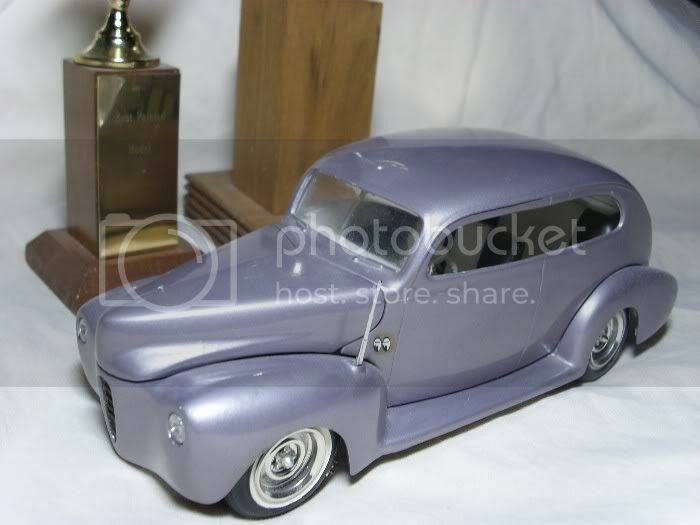 One of the models that always stood out to me was this’40 Ford Sedan “Kustom”. I mean, it was purple, and it had eyeballs. Plus it was sealed behind glass, so it was completely unattainable, and my dad sort of freaked out if I got near the glass. It was the forbidden fruit of model cars. I got the last laugh, though, because through the course of everyone moving and moving out, packing, boxing, and unpacking things along the way, the model has taken residence in my house for more than a decade now. And I can play with it anytime I want to, thank you very much. The only bad part is, it’s too cool to play with. Dad has never seemed like someone who would have been patient enough to build a model like this. Don’t get me wrong, I have the utmost respect for him, but he’s always been pretty ham-fisted. I remember him putting a screw driver completely through his thumb doing routine maintenance on some car once. And if you could go to jail for nasty, tantrum-induced language, he’d be serving a life sentence. But he was a real craftsman when it came to these old model cars. And this ’40 Ford is a really fine example of just what he was able to do. 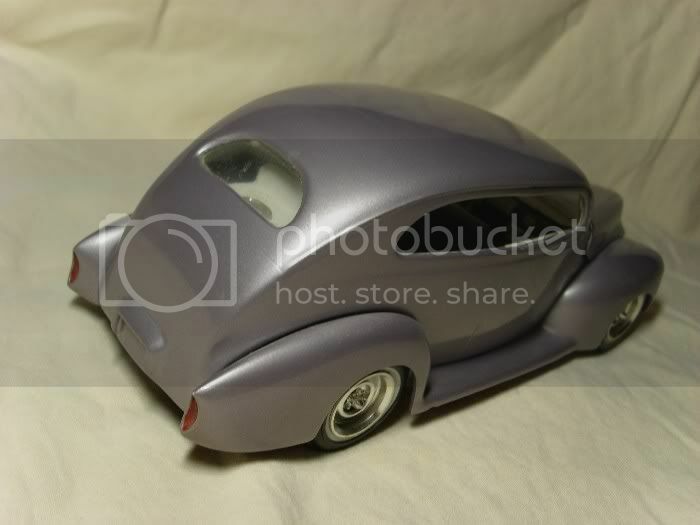 Back when this model was built, cars like this dominated the magazines. The big name builders like George Barris even wrote model car columns in some of them. Model car building was extremely popular, but the materials and parts to do something like this were not as sophisticated as they are today. Modifications often had to be made from scratch, which was the case here. 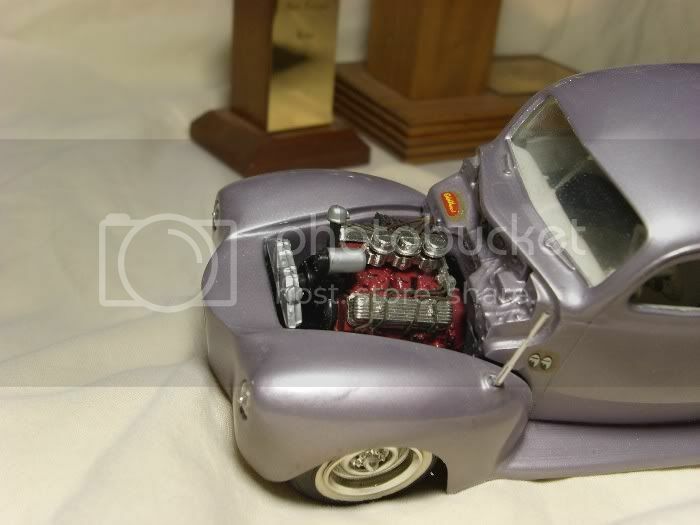 Other than the basic outline of the body, very little of this model resembles a stock ’40 Ford. The entire frontend was reworked to accept a ’58 Edsel grille, complete with real wire “tubes.” That also meant that the hood had to be reshaped to fit up with the new grill header. And the big ’40 Ford headlight housings were filled and replaced with Frenched-in Lucas lamps. The rear fenders were lengthened and shaped to accommodate ’59 Oldsmobile taillights turned on their sides. There was also a Frenched license plate holder scratch built into the bodywork back there, which matches the “sunken” antenna on the front fender. Dad always said the work was done with real lead body filler, which makes sense because there were plenty of cars that needed dents taken out on Granddad’s used car lot, so that material was available. If it worked on real cars, why wouldn’t it work on a model? The paint is another interesting little touch. The lavender color is actually called Orchid Gray, and was an option on 1960 Fords. The paint was purchased at the local Ford dealer, and was likely a current-model color when selected. Normally you see models this old with a thick coat of brush-painted airplane dope all over them, but the finish on this one is smooth and glossy enough to hold its own even today. Aside from the bodywork, there are some neat little details as well. For example, in addition to the capped exhaust dumps coming out behind the front wheel, there are some cool little scavenger pipes that sick out after the rear axle. Dad said he flared the ends of them out by heating the tips of a model sprue on the stove. Even the engine is wired, which is not something you see very often on a model this old. It even won a couple of trophies. 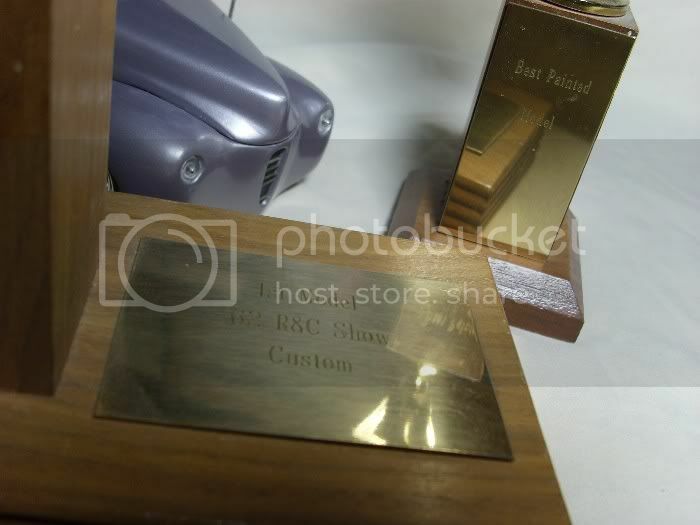 The one is for best model at an R&C model contest dated 1962, and the other is for best painted model. Normally, these old model kits didn’t survive quite like this one has, and if they did, they were rarely as well done in the first place. I’m glad it was behind the forbidden glass all those years so I can enjoy it now. It really is one of my favorite models in the collection, and I’m proud to have it. The detail and craftsmanship that goes into these highly detailed models always impresses the hell out of me. I love survivor models from the golden days of putty customizing and corduroy interiors. Ive been collecting them for years, each of them a unique piece of folk art with its own story to tell. The imagination shown back then was incredible. We have a Facebook group devoted to these vintage builds called "Scale Survivors". BTW, there is no way your dad used lead like on real cars on that model. Lead is applied using a torch. Love your dad's old build and I hope you will share more of them. Lead in a tube. Not molten hot liquid lead.